The Steranko History of Comics Volume 1 and 2 Group (Supergraphics, 1970-72) Condition: VG. Treasury-sized, with cover illustrations by Jim Steranko. 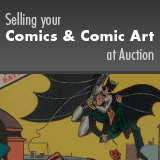 Jerry Weist's Comic Art Price Guide lists a total value for the two issues of $50 in Good and $100 in Fine condition.